Jared Leto performed with his band "30 Seconds To Mars" on 21 February 2014 at The Falkoner in Copenhagen, Denmark. Jared Leto was pictured wearing a gold sequinned / embellished blazer from Saint Laurent by Hedi Slimane, over a white top. I love the gorgeous blazer, G-Dragon from South Korean band Big Bang recently wore the same blazer while on a tour in Hong Kong. This is one piece that is perfect for the stage, and I love Jared Leto's interpretation as compared to G-Dragon. 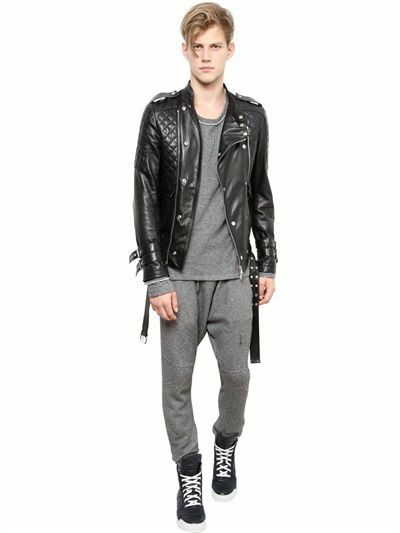 Jared Leto was also pictured wearing a leather biker jacket from Balmain. The jacket featured quilted panels with two pockets at the front. Not sure why the belts around the cuffs were missing though. In other news: the Academy Awards are coming up this weekend. Looking forward to his red carpet appearance, and I really need to catch "Dallas Buyers Club" before the weekend. 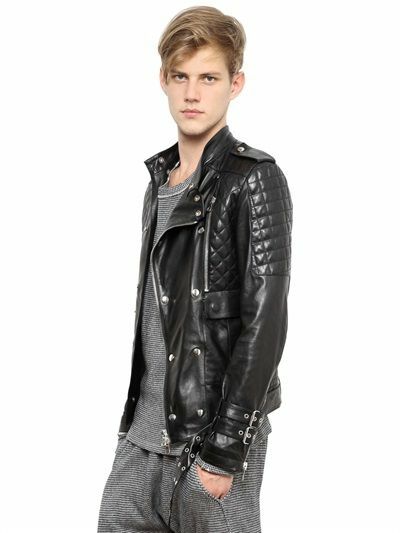 You can shop the Balmain quilted leather biker jacket online from Luisa Via Roma. His style is sooo good lately. Big inspiration.